To use this budget tool, fill in your current expenses in each appropriate column. 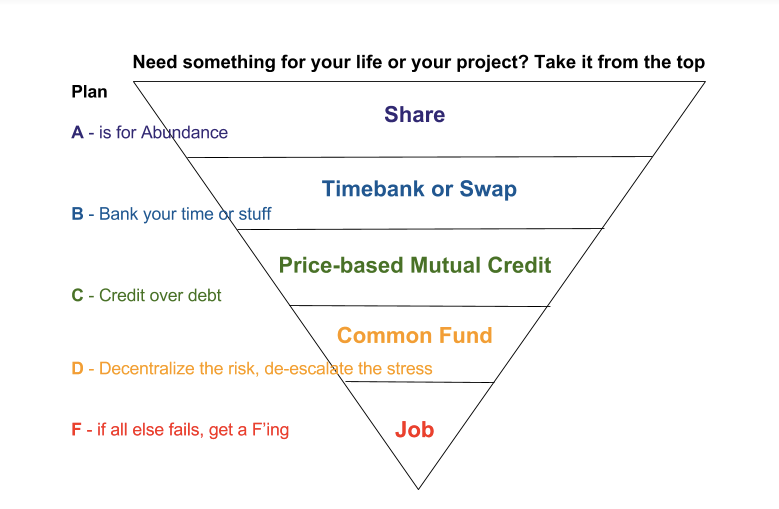 For next year’s budget, think of how you can replace expenses by starting with the most abundant resources first, using the Plan A-F on this upside down pyramid as your guide. Below are ways you might replace monetary expenses with other supports, for each budget line. Start or participate in a food swap. Include garden produce, excess from CSA shares, excess cooked food. 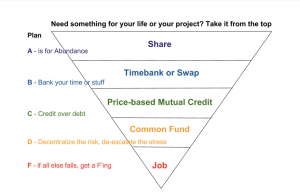 Earn timebank hours for organizing, deduct expenses accordingly. Use timebank hours to ‘hire’ someone to prepare meals for you. Reimburse for ingredients, discuss how to keep costs low. Complementary care access through timebanking. Use timebanking to access care for children and elders, people with illness or disability.